Music industry lobby groups may frequently seek to equate the Internet with lost revenues, but an examination of financial data from one of Canada’s largest music copyright collectives demonstrates massive growth in earnings arising from Internet streaming including major services such as Youtube and Apple Music. While many collectives do not publicly disclose their revenues, SOCAN, which represents composers, songwriters, and music publishers, provides a detailed breakdown of revenues and distributions in its annual report. 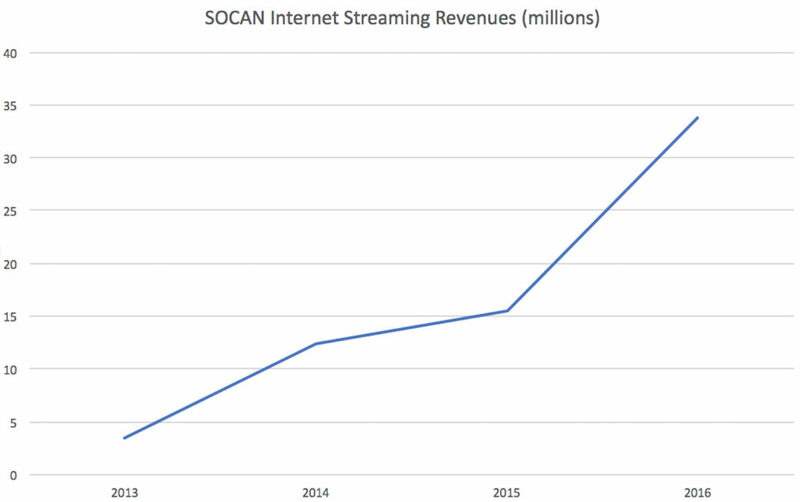 The reports show that since the 2012 copyright reform in Canada, SOCAN has experienced incredible growth in Internet streaming revenues. The 2013 SOCAN annual report noted that it was the first year that the collective distributed Internet streaming revenues ($3.4 million in revenue), which coincided with a performing rights licence for Youtube and an agreement that made it easier to members to receive additional money for music posted to the video site. Tracking the growth of revenues through the annual reports for 2014 ($12.4 million), 2015 ($15.5 million) and 2016 ($33.8 million), Internet streaming revenue is now SOCAN’s fastest growing revenue source having overtaken cinema, private copying, and satellite radio revenues and likely to surpass concert revenues in the coming year. SOCAN is just one music copyright collective and there are others that seek royalties for other participants in the music creation process. Indeed, the debate over Internet music streaming revenues is complex with many rights holders vying for revenues in a fast-growing segment of the market. Yet despite attempts to paint the Internet as a source of disappearing revenues for creators, the publicly-availability data tells a different story. In the case of songwriters, composers, and music publishers, the data unmistakable: in the aftermath of the 2012 copyright reforms, SOCAN has generated a 10X increase in Internet streaming revenues with growth rates of over 100 per cent over the past year alone. That isn’t a value gap. It is enormous economic value being generated for the benefit of creators and those that invest in them under current Canadian copyright rules. Is SOCAN distributing the revenues proportional to actual song plays of by aggregating the revenue to the top producers? That’s not the right measure. What is the total revenue generated year over year?